A mild chili pepper native to Mexico. A dried poblano is an "ancho chile". 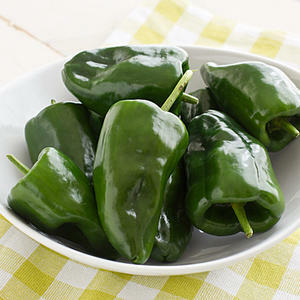 The poblano is a mild chili pepper that originated in the state of Puebla, Mexico. When poblanos are dried they're referred to as "anchos" which translated from Spanish means "wide". One thing we find interesting about the poblano is that while it tends to have a milder flavor, they can occasionally and unpredictably be intensely hot...talk about keeping you on your toes! The fully ripened poblano is red and is significantly hotter than the less ripe poblano. On the Scoville Heat Chart, Poblanos rank fairly low with ratings between 1,000 to 2,000 heat units.